We started our second morning in Berlin with a leisurely breakfast at the Pfefferbett Hostel. The breakfast buffet wasn’t too appealing but they had reasonably priced alternatives – aka a chocolate croissant for me and eggs and bacon for Seth. Our first order of business was checking into our next hotel. We’d considered extending our stay at the Pfefferbett because it was actually a very nice, new hostel with a funky bar area and super clean rooms. But there were a few annoying details – like showers that automatically turned off after a minute or so – that motivated us to find another place. We decided on the Circus Hotel, which had been recommended by both of my Europe books and also happened to be ranked No. 1 out of 600 some Berlin hotels on TripAdvisor. The room was ready by the time we got there around noon, so we dropped off our bags and headed off to explore the offerings on Museum Island. We started out with the Pergamon, which is renowned for its Greek and Byzantine relics. It was built to house the enormous Pergamon alter, which the Germans pillaged from the Greeks. I took several pictures of a replica of the walls leading to the main gate of Bablyon, but it doesn’t quite convey the scale. It was certainly worth the visit to be able to experience that perspective. I also enjoyed the Islamic art exhibit on the second floor. Of course, the Persian rugs weren’t as pretty as ours, but I’m sure they’re worth much more. 🙂 Pages from illustrated books reminded me slightly of our ketubah design, though of course the subject matter was very different. From the Pergamon, we rounded the corner to check out the Bode Museum. Seth went upstairs to read articles on his phone while I toured the exhibits at whirlwind speed (well, by my standards). Meanwhile, Seth chatted with a jolly old German guy from Dresden who had visited Canada at some point in his life, or that’s what Seth thought he was trying to say in his Germ-glish. To complete our museum-happy day, we went to the History Museum, but we didn’t even get through the top floor before it closed. That floor covered German history from the beginning of civilization through the end of the first World War. The second half of the museum covered the post WW I period onward. There was a lot of reading, which Seth enjoyed, and a surprising amount of art and artifacts. Racing against the sunset, we took the train to the “East Gallery,” which is one of three areas where remains of the Berlin Wall still stand. Artists were asked to decorate panels of the wall in this section, which resulted in a kind of memorial/public art project. It was surprisingly long, which gave a real feel for what it must have been like when the wall actually divided the city. After walking to the end of the gallery, we hopped a train back to the Pfefferbet Hostel stop. Though we were no longer staying there, a restaurant sharing the hostel’s courtyard called Tauro had previously caught our eye. Upon entering, we learned that it was actually two restaurants with completely separate kitchens: a Spanish tapas place downstairs, and a steakhouse upstairs. Since we’ll be eating authentic tapas in Spain shortly, we opted for the more generic menu. Seth got a rump roast to make up for the fact that I ate half of his meat the previous night, and I had sea bass on top of a “salad” of tomatoes (fresh and sun dried) and buttery fried bread. Little Mole helped us lick the plates. We killed time working on the computer in the lounge until the tour guide, Espin, came by the Pfefferbett at 12:40 p.m. That turned out to be less convenient than it seemed because we ended up tagging along as he rounded up more tourists at three other hostels. For a while, we were both worried that the tour would be a bust since we’d been walking for at least 20 minutes in intermittent rain showers and Espin hadn’t said two words about the city. Thankfully, Espin proved us wrong once he officially launched into his shpiel, starting with his personal connection to Berlin: Originally from Yorkshire, he moved to the city six years ago to pursue his music career. He works as a tour guide by day, dedicating nights to his band, The Gecko. Berlin is a very young city in two different respects: it’s only been around since the 14th century, which is unusual for a European capital, and the actual population of the city is very young. It’s stunning how many young people you see walking around. There’s even a disproportionate number of baby strollers from all the young parents. It’s the diametric opposite of Munich in that sense. It’s also Munich’s opposite architecturally, as everything built since the fall of the Wall is modern. Espin gave us a nice overview of the city and its history as we stood before a cluster of museums on the appropriately named Museum Insel (Museum Island). He pointed out which museums to check out and which to pass on (crucial in a city with over 190 museums). On our way past even more museums, we stopped at an impressive memorial to those who suffer in war. It was a statue of a mother cradling a dying child inside an otherwise empty rectangular building. Beneath the floor lies an unknown soldiers’ body and the ashes of Holocaust victims. To complete the stark, gray scene, the artist left a circular opening in the roof above the figures, leaving them vulnerable to the elements – an extension of their suffering. I found it to be very moving. The highlight of the walking tour was Espin’s small but enlightening dissertation on life in divided Berlin. Under an awning at the Topography of Terror exhibit, he busted out a homemade map of Germany and its neighbors during the Cold War. He explained how the desperation of East Germans to escape to West Berlin was primarily driven by the massive economic disparity between East and West. Putting it in this context immediately brought to mind the present day U.S./Mexico border. It even has some parallels to the new wall that Israel has built to divide itself from the Palestinians in the West Bank. We eventually made our way to the relatively new memorial to the Jews murdered in the Holocaust. It’s a fascinating, massive expanse of undulating concrete blocks aligned in parallel rows. No two blocks are exactly the same size or cut at exactly the same angle, which means any given perspective of the memorial is unique. The design intentionally makes no direct reference to the Holocaust or any aspects of history, leaving the interpretation entirely up to the viewer. It was intriguing from the outside, and both of us found it quite powerful once we began walking through it. As you follow a path through the taller blocks you begin to feel more and more cut off from the outside. Eventually, the only way you can really see out is to look skyward. It evoked a connection to what camp prisoners must have felt when they looked up to the sky as their only visible path to freedom. While the memorial is understandably controversial due to its abstract form, we came away with an appreciation for what the artist achieved. We wrapped up our tour at a rainy Brandenburg Gate. It was pretty amazing to compare the current state of the square in front of the gate to 50 years ago when the landmark was rendered completely inaccessible between the inner and outer Berlin walls. Since we were close to the Sony Center, we decided to head over there to take advantage of its free WiFi. We spent an hour or so doing Philly Dance Fitness work while downing a tasty ice cream and yogurt sundae. Then, we took the train back to the Pfefferbett area in an attempt to find one of the three local Weinerei. Supposedly, you can go into one of these places, pay a euro for a wine glass, and then taste and or drink as many wines as you want. When you’re done, you pay as much money as you think you should. 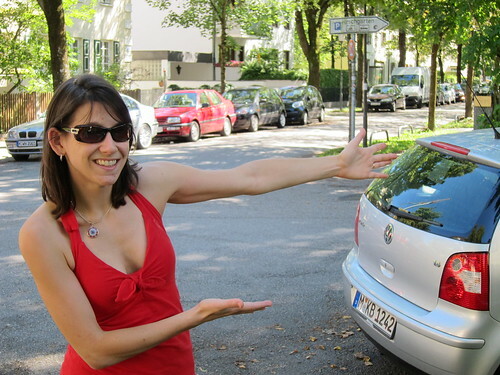 We were both quite excited because we’d planned to find the Weinerei that also had food options served the same way. Unfortunately, all we could find was the storefront where it *should have* been. We later learned that it had just closed down a few weeks prior. We eventually popped into a bar called 103. The waiter there was very helpful, as he proceeded to basically translate the entire menu for us. I ordered a rump steak and Deb ordered a pizza/kugel thing. The waiter’s original description mentioned cheese, onions and tomatoes. He left out one minor detail: it also had bacon in it. This made it extra delicious but Deb couldn’t eat it. So she took the lead on my steak and I took her tasty “pizza” off her hands. We both cleaned our plates. While we were eating, we heard pretty much all American musical selections including songs from Pulp Fiction and Kill Bill. However, things got crazy once the Michael Jackson came on. I got a full on reprise of this summer’s Michael Jackson Hip Hop Workshop courtesy of Deb. I’m guessing the staff was amused because our friendly waiter insisted that the chef would prepare us a creme brule for desert even though the kitchen was clearly closed at that point. On our last morning in Budapest, we got up early to see the inside of the Parliament building. It came well advertised as I believe it’s the second largest parliament building in Europe, behind British Parliament. They’re actually very similar architectural styles. However, when we got there right at the opening time, we were disappointed to find it was closed due to some visiting dignitaries or something. Apparently we weren’t the dignitaries they were prepared for, much to our chagrin. We salvaged the morning by walking to the river to see a brass shoe sculpture in memorial to the Jews who’d been lined up and shot into the river, leaving only their shoes behind. We pulled some death-defying maneuvers to cross the busy street back to a tram stop that would take us further along the river to a large indoor market. We thought we knew of a nearby recommended cafe for lunch, but the kitchen wasn’t open when we got there so we scooted across the street to another place. The food there turned out to be quite unimpressive, but at least the people watching was good and the fresh air was nice. The market was reminiscent of the Reading Terminal in Philadelphia, albeit a bit more organized. While Deb picked up a few souvenirs, we met a traveler that would spend the rest of the trip with us: Little Mole, a character from a Czech children’s show modeled after Mickey Mouse. He hopped onto our backpack and we were on our way. We eventually realized that all the prepared food you could eat right in the market was upstairs. It would have been good to know that before we ate…guess we’ll just have to come back on another trip! From there, Deb, Little Mole and I rode the subway to see the statues at Heroes Square. We’d heard that a temporary horse racing track had been installed in the park for a special festival that day, so we were expecting a crowd. We didn’t expect the crowds to be so large, however, that you couldn’t even see the track! There was a large video board for viewing the race from afar, but we didn’t have time to stick around for the next race. Instead, we walked back down Andrassy Ut toward our hotel, perusing the cultural displays, vendors and food stands lining both sides of the street. It was almost like walking through a Renaissance fair, especially when groups of people dressed in traditional garb from their respective regions broke out into song and dance in the middle of the throng. We spent the rest of the afternoon traveling – an easy train ride to the airport, then a short flight to Berlin, and a train/subway route to the Pfefferbett Hostel. Even though the hostel was right near the subway stop, it was tucked away in a renovated warehouse complex that you couldn’t see from the main street. We ended up asking for directions twice and walking in a wide circle to get to the entrance. That wasn’t the end of our walking in circles, unfortunately. After dropping off our bags, we headed off to find a Middle Eastern place that was supposed to be walking distance from the next stop on the subway line. Of course, we walked the wrong way when we got off the train. Even after we corrected our mistake, we couldn’t seem to find the restaurant, so we settled on an Indian place that we’d passed instead. We’d heard that Berlin had a number of excellent Indian places, and this lived up to that reputation. On our third day in Budapest, we set out to tour the inside of the Great Synagogue, stopping en route at St. Stephen’s Basilica, the largest church in the city. While most churches are named after religious figures, the “saint” of this basilica was actually the first king of Hungary. Apparently, he was so well-loved that the people elevated him to sainthood. After he was entombed, his right hand became mummified and the Hungarians thought this was some kind of sign from God. So what’d they do? They put the hand on display in the cathedral. Of course. You have to drop a euro into a machine to light up the case that it’s kept in if you actually want to see it. Luckily, our tour guides had forewarned us about this and given the useful tip to just stand there and wait for some other sucker to light up the box. The highlight of the church, however, was taking an elevator to the top of one of the towers where you could see a 360 degree view of the city. After that grand vista, we moved on to the Jewish section of town, starting at the Dohany Street Synagogue. The main sanctuary was absolutely immense with seating for over 3,000. Oddly, its decor was not distinctly Jewish in any discernible way. There were numerous stars to be seen, but they were eight-pointed stars rather than the six-pointed Star of David. The architect was obviously inspired by Arabic themes. Another element we don’t commonly associate with synagogues was the large fully-functional organ. It was quite transparent that the Jewish community wanted to compete with the likes of the Christian cathedrals that are so common across Europe. Attached to the front of the synagogue was a collection of Judaica and a few small history exhibits that were remarkably mundane in a way. It’s amazing how you can travel the world to different Jewish communities, and yet most of the material aspects of Jewish life look utterly interchangeable. A side wing of the synagogue that was built years after the original building was designed to be a small park, but was turned into a mass grave during World War II. It’s extremely unusual for bodies to be buried near a synagogue, as Judaism tends to segregate death from life. However, in the aftermath of the war the community decided to turn the area into a memorial rather than exhume the bodies. Past the graveyard garden was a fantastic silver sculpture reminiscent of a weeping willow – a memorial to the 400,000 Hungarian “martyrs” who were murdered by the Nazis, as well as a statue in honor of Raoul Wallenberg and other heroes who rescued Jews who would have otherwise been bound for concentration camps. To complete our Jewish tour, we walked a few short blocks to another synagogue that’s apparently been under reconstruction for years. The colors were stunning – deep reds, blues and purples, with a kind of Persian motif decorating the main dome. Aside from the walls, however, the building was just a partial shell, with no staircases to the balconies, no pews and no bima. Clearly, it will take years of fundraising to complete this project. We were past due for lunch so we trusted the handy map from our free tour to navigate to the nearby Castro Bistro. Yet again, we ended up with an amazing meal: chicken and apples in a curry sauce for me; a bacon-y chicken thing for Seth, plus local beer and wine and a huge slice of “repartorta,” for dessert. Repartorta means carrot cake, a highly important Hungarian word for my vocabulary. Stuffed, we headed to a markedly darker sight, the Terror Hauza. The house at Andrassay Ut 60 was once the base of the occupying Nazi power and their collaborators in Hungary – the Arrow Cross party. It served not only as a bureaucratic home for the fascists but also a basement detention center and sometimes torture chamber. When the communists took over, there was a natural transition as the powerful secret police elements of the Soviet regime set up shop in the same building. Today, it’s a stark museum that chronologically traces the two consecutive reigns of terror. Printed sheets of information in each room offer great detail of various aspects of the oppression. Unfortunately, a few of the rooms were out of English sheets, so we found ourselves wandering through a maze of soap walls without any clue why. The museum tour finishes in the basement dungeons where prisoners were interrogated and often tortured. With just a little daylight left, we hopped a trolley toward Margit Island. I mainly wanted to go there as a tribute to my great aunt Margie, who was named after the island and always so proud of her Hungarian heritage (and cooking – which I can appreciate even more after consuming countless delicious calories in Budapest). The island is basically a large public park, though there were a few hotels with thermal springs further in. We rode a bus toward them, and made our way back toward the main entrance on foot, stopping to feed the fish and turtles in a little pond as we went. We didn’t get far before the sun set, though, so we ended up catching the bus again and transferring to another line to get back to Deak Square in Pest. There, we stumbled upon a wonderful jazz band from Prague at a “sunken” semi-outdoor club called Godor, which was built in the underground parking area that was originally intended to be the foundation of a new National Theater. The government abandoned those plans, and hip youngsters stepped in to repurpose the space, similar to the story of the ruin pubs. Not only was there free music there, a crowd of swing dancers was out in full force! Hungarian swing dancers! It was a little tough to crack into the scene with my Phillies shirt and lack of dance shoes, but I got a few dances in with some authentic Hungarian swingers before the band finished the set. I would have stayed around longer but our stomachs were growling so we walked on to find food. Since it was already late, we ended up at one of the trendy looking restaurants on a pedestrian street near the Opera House. We should have stuck to our map recommendations. The food was a huge let down, especially after all the wonderful meals we’d had so far. Seth’s chicken tasted like it was coated in mustard and my goulash was just okay. On the plus side, we had mini cakes and duro ruddy, a beloved type of Hungarian candy, back at our room to give us a sweet ending to a busy day. We started the morning with a late breakfast at the Ring Cafe a few blocks down Andrassy Ut, one of the main city streets. I went for the perfect alcohol/late night remedy with an “American breakfast” of eggs, pancakes and bacon while Deb got eggs with veggies. It wasn’t anything special but it got the job done. We then walked a few blocks to the National Opera House to buy super-cheap last-minute tickets to the ballet version of “A Midsummer Night’s Dream” for later that evening. To save ourselves from another potentially frustrating ticket counter experience, he set us up with passes to the Szechenyi thermal bath. It’s the largest bathhouse in the city, with an incredible number of naturally heated pools. The complex was massive and obviously very popular based on the number of people there. Each of the pools was a different temperature so you could pick your poison. In one of the indoor pools a woman was leading an “aqua-cize” class so Deb joined in. By her reviews, the teacher was very straight-faced but had excellent posture and decent moves. I was amused because Deb brought the average age of the class participants down a few decades. We eventually made it back outside to the larger pools where we found a pretty intense circular wave pool. Once you slip into the current it whisks you around in a circle. In fact, trying to escape the pool is quite a challenge. I nearly wiped out face first into a wall. After about two hours of spa time, we headed back to the hostel to change and meet up with a “free” Jewish tour run by the same company that we had toured with the day before. Two guides ran this tour, a younger woman and an older man who did most of the talking. He was extremely knowledgable, but needed some work on his tour organization. The best tours we’d been on so far had a cohesive story or theme that tied everything together. In this case, it was random anecdotes and information about the buildings we happened to pass, which included three synagogues and a few kosher eateries. We did wind up with a pretty good sense of the history of the city’s Jewish community, and an unexpected media connection: Along with us on the tour was Alex Weisler, a reporter who’s touring Europe as part of a grant project for the Jewish Telegraphic Agency. Given the size of the Jewish press, Alex and Deb together in Budapest almost constituted an international Jewish media convention. After the tour, we stopped for a quick dinner at a no-frills local place called Frici Papa on the recommendation of our tour guide. It turned out to be another one of the best meals we had on the trip. Deb had creamy chicken paprikash with sweet red wine and I had a beef stew with surprisingly good Hungarian beer. Everything was absolutely delicious. All told, the dinner cost barely $10. From there, we hustled over to the opera house for the ballet. We immediately found that we were quite underdressed, but no one gave us any nasty looks…that I noticed. The building was beautiful and immense inside. We’d never seen a stage so deep before; it was probably three or four times the depth of a typical Broadway stage. Of course that only exacerbated our viewing angle issues. Eventually, Deb stood up behind the last row in the center of the balcony (along with several other folks) to get a better view. I did some neck craning and napping in my seat. Aside from the crappy seats, the production itself was pretty impressive with quite a large cast. It was well worth the $5 we paid, but next time we’ll be better prepared for our encounter with the ticket ninja. About a half hour before our train pulled into Budapest, the attendant woke everyone up with a croissant and juice for breakfast. From there, we had a surprisingly easy time navigating by metro and tram to the “Homemade Hostel.” We were both pretty psyched to stay there since it got fabulous reviews, and we weren’t disappointed in the least. The hostel was located on the second floor of a large apartment building in what seemed to be Budapest’s “wedding row” since there were a ton of wedding dress shops along the street. It was a fairly small hostel – three big rooms joined by a shared living space and kitchen area. We actually stayed just down the hall in a separate, studio apartment that also belongs to the hostel. It was the perfect set-up: we had our own private room with a private kitchen and bathroom, but we could socialize with the other guests in the main common area. As nice as it was to have our own space, the young hostel staff and guests were even nicer. Since we were way too early to get into our room, we dumped our bags and headed out to catch a free city tour along with another hostel guest named Gabriel. Emma, our guide, was highly entertaining and informative. She gave us a great sense of the history of Hungary as well as the modern culture, which is shaped by an interesting generational divide. A few decades after the end of communist rule, the younger generation is excited about engaging with the western world and building a more productive, capitalist society. Many older people, on the other hand, remain firmly set in communist/socialist ways. 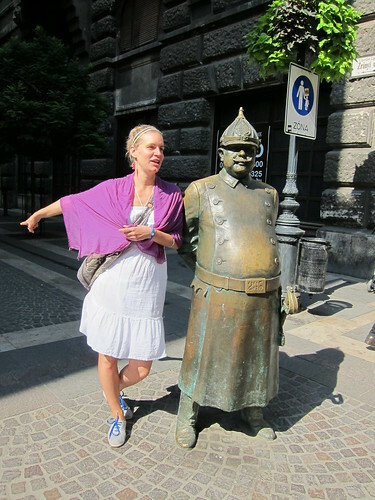 Emma also pointed out that Hungarians really seem to like rubbing statues for luck. We saw at least three different statues with nicely shined spots that people touch daily for luck. A favorite was a jolly old policemen with a polished brass belly. After the tour wrapped up, we took the guides up on their invitation to tag along for lunch at a cafeteria not far from Fisherman’s Wharf. This was not the kind of place you find in a guidebook. There were no menus in English and Emma had to stand by the counter to relay our orders to the cook (who did not seem at all pleased about a gaggle of tourists slowing her down, no matter that we were all spending money there). Despite the service-without-a-smile, the food was amazing. Amazing. I had a mushroom soup and some kind of sausage and rice mixture. Deb had chicken with corn in a thick cream sauce served over spaetzle. It was like the Hungarian equivalent to Southern soul food. We took a tram back to the hostel where I promptly crashed for a nap to catch up after my torturous night on the train. 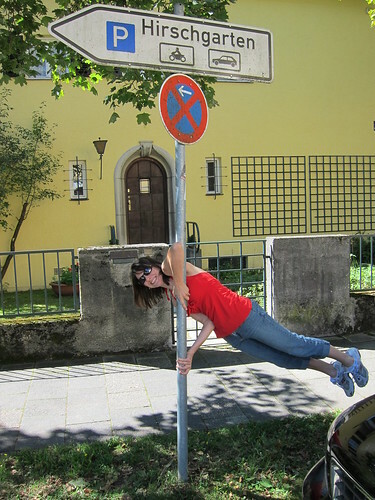 Meanwhile, Deb headed out for some Zumba, Budapest style. When I finally came to, we joined the other hostel guests for a free home-cooked meal from the staff. We’d read about this perk online but thought we would miss out since the dinners are normally hosted on Tuesday nights. Apparently, they had so much left over from the night before that they decided to do an impromptu repeat. Even better, they made a fresh batch of stew with chicken for Deb (and vegetarian for our tour-buddy Gabriel) since the leftovers contained sausage. It wasn’t nearly as good as lunch, but it was really nice to chat with the other guests as we crowded into the common room to eat. And, of course, it’s hard to beat free. Since we were enjoying the company so much, we decided to stick around for a hostel bar crawl that included a free glass of wine or beer at five bars. Deb and I split one ticket since neither of us felt like downing that much alcohol. Budapest has plenty of bars, particularly in the Jewish quarter. 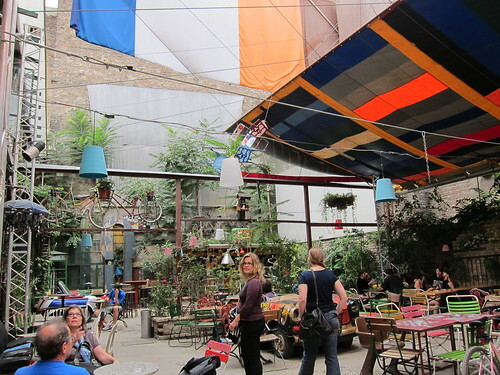 This might sound odd at first, but a unique thing has happened in Budapest over the past 10 years or so: Young people began squatting in abandoned buildings (and there were plenty in the Jewish quarter after the fall of communism) and scavenged around for anything they could find to repurpose the space into a unique hangout. The resulting “ruin pubs” are extremely hip now. The last one on the tour, Instant, was particularly weird, from the music selection to the freaky human/animal creatures painted on the walls. We also had the “privilege” of tasting Hungary’s national alcohol, Palinka. Wow is it terrible. It goes down like Everclear, and if you’re lucky it doesn’t quite taste like cough syrup. 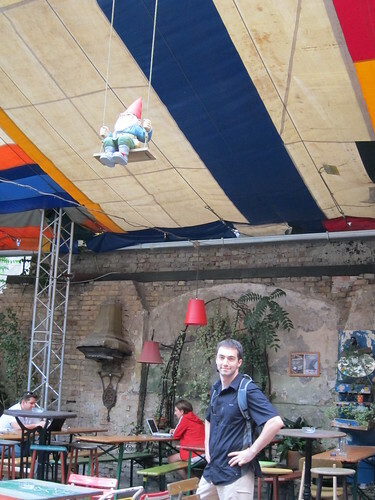 A special highlight at a ruin pub was seeing the Travelocity Roaming Gnome of Amazing Race fame. Somehow, we just barely made it back to the center of the Old Town for a 10:45 a.m. “free” walking tour. Our guide, Christian, was a Scottish immigrant with a flair for the overdramatic. When he wanted to point something out, he’d throw his hands up behind him and yell, “BAMMM!!! Look at this statue!” It bordered on being obnoxious, though he seemed like a very nice guy otherwise. He pointed out several interesting things, including the border between the old and new town, an interesting “faceless” statue in front of a theater where Mozart had performed and historic buildings that were distinguished by symbols (like a Black Madonna) instead of address numbers. We decided to leave the tour about halfway through, however, because Christian said they would head to the Jewish quarter next, which we’d just explored the day before. We stopped at a random spot for lunch just off the main square, which turned out to be fairly tasty and not too expensive (It was called Cafe Domecek, but don’t ask me how to pronounce that). I had beef with a mushroom sauce; Deb had a similar beef stew with a different kind of sauce. After lunch, we headed back to Mala Strana, stopping in the square on the way to watch the anti-climatic astronomical clock “show.” Instead of heading straight to the castle to finish off the tour we’d started the day before, we went one more tram stop to the Strahov Monastery. Aside from more picturesque buildings, the complex contained several small museums and libraries. Deb had read about a miniatures exhibit that she wanted to see, which ended up being quite fascinating. The “museum” was nothing more than two small rooms containing about 30 works by Czech artist Anatolij Kon?nko. The artwork itself was invisible to the naked eye, you had to look through microscopes or magnifying glasses to see the itty bitty teeny tiny train that Konenko had attached to a piece of hair or the wing of a mosquito or something crazy small like that. Aside from a few articles in Czech left on the table in a plastic sheet protector, the artwork was left to speak for itself. From the museum, we continued toward the back of the monastery, which had a stunning overlook of the nearby castle and the city below. We could have walked to the castle from there, but decided to head back to the tram instead because we didn’t trust ourselves not to get lost. Back inside the castle, we toured a basilica that was fairly unimpressive compared to the huge cathedral (though it did have a cool alter with a see-through container of some important person’s bones). The former Royal Palace also left something to be desired. We were expecting lavishly decorated rooms, but instead it was mostly empty stone rooms. One chamber contained colorful crown jewels (perhaps replicas) that everyone seemed crazy about except for us. As it turned out, the most entertaining part of the castle was just inside the entrance to the Royal Gardens, where we found falcons, owls and eagles tethered to perches. Deb and I were both pretty psyched to hold and pet the birds, though I think Deb scored a bit higher on the enthusiasm scale. After what was probably an hour of chatting with the falconers, we meandered through the rest of the Royal Garden aiming to eventually wind up in the main part of Mala Strana. At one point we thought we’d found the path to take us all the way down the hill, but after a couple hundred feed our “path to nowhere” ran into a dead end. Naturally, we had no choice but to walk back uphill before we could find another path out of the gardens, where we caught a tram to take us the rest of the way down. From there, we walked through an area of Mala Strana that we hadn’t already covered and happened upon the John Lennon wall. Personally, I didn’t find it all that exciting. It was just a wall with some graffiti on it. Deb, however, was entertained by a group of guys who were standing on each other’s shoulders in order to add their personal touch to the collaborative artistry. More importantly, our trek to the Lennon wall uncovered several cute galleries which Deb made sure to support by making a few purchases. We crossed back over the river, this time by foot on the Charles Bridge. It was a total ambush. The bridge was covered with local artists selling jewelry and other “fun stuff.” Thankfully, Deb obliged my growling stomach before doing too much damage, though she certainly didn’t come away empty-handed. Once across the river, we hopped on a tram to another amazing dinner at a place called Stare Doba, another guide book find. I had a steak smothered in blue cheese cream sauce with a tasty — and cheap — beer. Deb had a MASSIVE potato pancake stuffed with chicken, vegetables and all kinds of tastiness. When I say massive, we’re talking over a foot in diameter. Sufficiently stuffed, we took a purposeful trek back to Kava Kava to snag that elusive slice of carrot cake. Deb saved it for breakfast the next day, and reports are that it was just okay. That didn’t stop her from carrying it like a baby as we scampered to the hotel to grab our bags and back to the metro stop to head to our next destination: Budapest. We at least learned our lesson this time – there was no walking to the train station. I was super excited for the train ride because we’d be in sleeper cars for the first time. I don’t know what I was thinking. First of all, Prague was not the first stop, which meant that there were already 4 people sleeping in our 6 person cabin. It was hard enough to get into the cabin with the lights off, never mind trying to find space for our bags when our cabinmates had already used up basically all of the storage space. To make matters worse, someone was already in my assigned bunk. Deb and I had gotten bunks across from each other (at least we thought we had), but that was now out the window. I was left with the top bunk, which wouldn’t have been so terrible if the air in the cabin worked at all. Instead, I boiled all night. Needless to say, it was not a comfortable trip and my illusions of awesome sleeper cars were shattered. Naturally, Deb woke up chipper after a good night’s sleep on the lower bunk. Determined to actually tour the Jewish area, we got up earlier and headed straight to the Pinkus Synagogue after breakfast. We bought a pass that included admission to all six historic synagogues and the Jewish cemetery. I’m pretty sure it was the most expensive “attraction” we paid for this whole trip. The synagogues seemed small, but Seth pointed out that the fact that there were so many of them in such a small area indicated that the Jewish community was actually quite large. The Pinkus, where we started, had been converted to a memorial to the roughly 80,000 Jews from Prague and surrounding areas who had died in the Holocaust. Their names and birthdays completely covered every wall in the sanctuary and even the balcony above. Also upstairs was an exhibit of drawings from children who had been allowed to study art, writing and science in the Theresienstadt ghetto. Most of them were later sent to concentration camps, where they died. To exit the Pinkus, we wound through the cemetery, where grave stones were piled on top of each other in seeming disarray. Apparently, because the Jews were not allowed to bury their dead outside the ghetto, they simply added more “layers” to their cemetery. Nobody knows exactly how many bodies are buried there, some estimate as many as 100,000. About 12,000 tombstones are visible. The narrow, one-way path ended at the entrance to another synagogue. All six were within a few blocks of each other and most had displays explaining different periods of the community’s history. My favorite was the Spanish Synagogue, which was decorated with rich blues, reds and purples. Seth’s highlight was reading through the exhibits. When we finished our walking tour of the Jewish quarter, we did the obvious thing and had pastrami and lox sandwiches at the nearby Bohemian Bagel. By that point, it was already mid-afternoon, so we scooted across the bridge to take a tram up to the Prague Castle. We only had about an hour and a half before the buildings closed, so we started with the reconstructed shops along the “Golden Lane” at the far edge of the massive complex and worked our way back to the central Cathedral. Luckily, the admission was good for 2 days, so we made plans to come back the next day. We took a tram all the way back to the hotel so that we could have a more scenic view of the city, changed clothes and went right back out for the highlight of the day: a three-hour dinner cruise on the river. The boat was pretty nice – the top deck had picnic-style tables and benches while the main deck had a restaurant area where a trio of musicians played big band jazz. Luckily, we sat near the buffet so we didn’t have a long wait in line for the traditional Czech dinner. For the most part, the food was good, particularly the desserts, and there was more than enough for everyone. The only thing we had to pay out of pocket were the drinks. All in all, it was a lovely, romantic evening. After the cruise came to an end, we wandered around the Old Town area, stopping to shop at a few places. From there, we took the subway to a cafe called Kava Kava because one of our guidebooks had mentioned their huge carrot cake slices. Of course, it had already closed by the time we got there so we headed back to our hotel carrot cake-less. We set out on our first day in Prague with the intention of touring the Jewish Quarter, but ended up across the Vltava River in Mala Strana instead. We’d had a hotel breakfast earlier, which was actually a fairly extensive buffet, but we were ready to eat again by the time we finally walked to the closest subway station and purchased 3-day transportation passes. Following our stomachs, we headed to “Bar Bar,” a trendy restaurant that was recommended by our Let’s Go guidebook, figuring that we’d work our way back across the river after lunch. The food was well-worth the extra time it took to find the place. Seth had a chicken dish served over a blueberry-cheese risotto and I had a fresh crepe filled with salmon and greens. The decor was more funky than the food – muppet-like sculptures inside old television sets on one wall and lots of paintings and photos covering the others. Continuing our trek back toward the river, which serves as a natural divide between the Mala Strana and Stare Mesto neighborhoods comprising the historic city center, we detoured at the Wallenstein Garden. Along with a large koi pond and several bronze statues, the garden had an artificial “drip rock” wall that looked like something out of the set of the movie “Labyrinth” (Specifically, the scene where Jennifer Love Hewitt is falling down a passageway of hands, if you happened to ever see that movie, one of my personal childhood favorites). A plaque near the wall said it was designed to look mysterious, which also explained the numerous wooden doors in the wall that all apparently went nowhere. Near the drip wall was a small aviary with birds of prey. I’m sure they were frustrated at not being able to get at the peahens and peacocks running around the grounds. We also went inside part of the senate buildings overlooking the gardens. The large meeting halls were nice to look at; otherwise the exhibits showcasing Czech lawmakers and the various tea cups and medals they’d been given were fairly unexciting. The train stop was right at the exit to the gardens, so we crossed the river underground to get to Josefov, the Jewish neighborhood. It was early evening by then, so we just looked at the outside of a synagogue and window-shopped. It was easy to get turned around in the narrow streets, but that was also part of their charm. We succumbed to temptation at a chocolate shop, buying a few overpriced truffles to fuel us along as we headed toward the National Theater. Like practically every building there, it was stunning on the outside. We took a break across the street at Cafe Slavia, a recommendation from a different guidebook. The cafe, originally opened in 1881, had been a popular hangout for artists and intellectuals, including former president Václav Havel. Aside from the history, it had a great view of the river and even better desserts. Seth had a tuna tartar appetizer before his caramel ice cream, while I went straight for the chocolate cake with maple walnut ice cream. It was supposed to be a snack to tide ourselves over before a late dinner, but it ended up being dinner. We walked off some of the calories on the way back to the hotel, winding along the river to the “Dancing House,” a curvy condo tower designed by Frank Gehry. I thought it was beautifully imaginative but apparently some Prague residents have been vocally opposed to such a “weird-looking” building. On our last day in Munich, we took a tram to Nymphenburg Palace, which was built in the 17th century as a summer residence for Bavarian rulers. It was expanded over the years, and now the massive complex is a local hotspot for wedding photos (we saw two newlyweds during our brief visit alone) as well as a popular tourist site. 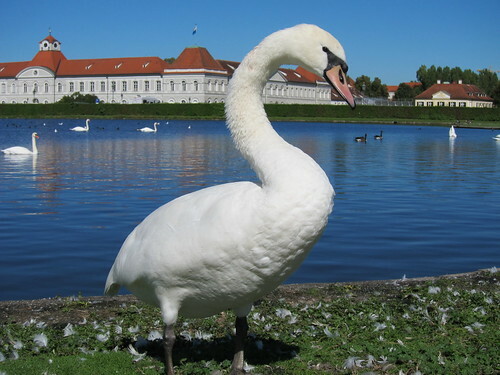 Leading up to the palace is a well-manicured stream and a series of ponds stocked with photogenic swans. Various rooms inside the main building have been restored to their original form, including the “Gallery of Beauties” lined floor to ceiling with portraits of women that King Ludwig I deemed attractive enough to represent his idea of beauty. We completed our tour by walking through the large garden behind the castle, and then headed by foot to the Hirschgarten, the largest beer garden in the city with seating for up to 8,000!! There were some interesting signs leading the way there. In truth, I had no interest in the actual beer part of the biergarten scene, I just got a kick out of the fact that it was spelled the same as my last name. 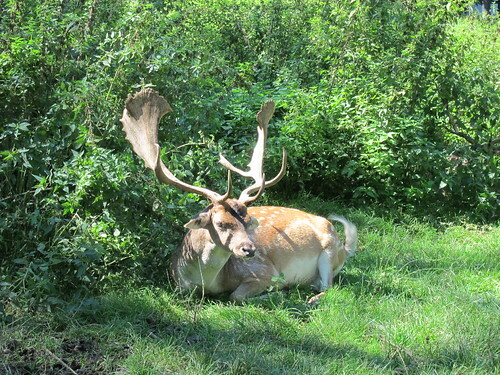 Plus, in honor of the Hirsch namesake, which means deer, there were live deer in an enclosed area not far from where the tables were set up. While many beer gardens in Munich were just outdoor seating attached to a beer hall, for when it gets cold, this one was at the center of a very nice, and very sizable public park. There were a number of swing sets and other playground areas for kids as well as nature trails, food stands and so forth. Compared to Philadelphia, Munich clearly wins the prize for better, cleaner and larger parks. Other than the deer, the beer garden itself wasn’t anything special but they did have chicken, which was a welcome surprise. 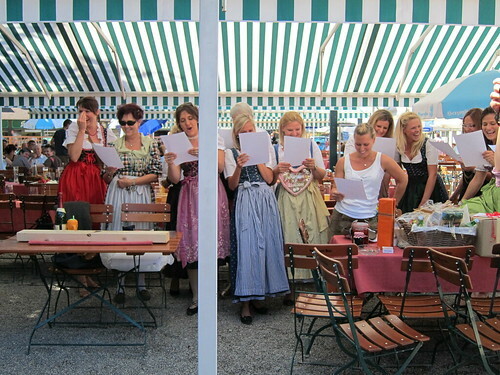 Authentic Bavarian eateries don’t generally have much to offer for those who aren’t into pork and beer. Not only did they have chicken, but it was quite tasty. The bees thought so, too. We couldn’t seem to escape them, but that was the only downside to lunch. Seth also enjoyed his currywurst, which was basically just another variation of bratwurst but with a curry sauce (also very popular in Berlin, we later learned). After that, it was back to the train station for a six hour train ride to our next stop on the honeymoon tour: Prague. We lucked out on our train car. A friendly couple sat with us for the first hour, another young guy came in for a short while after that, and then we had the seats to ourselves to stretch out and get a bit of sleep. It was around 11 p.m. by the time we arrived in Prague, so we headed straight for the Hotel Ametyst in Vinohrady, which is only two stops by train from the center of all the tourist attractions but a deceptively long walk from the international train terminal – especially with a backpack on! Our map indicated that it was only a half a mile, but Google Maps later confirmed our suspicions that it was more like a mile.